DupScout Server provides the ability to automatically select original files and duplicate files removal actions according to user-specified rules and policies. In order to configure automatic duplicate files removal actions, open a duplicate files search command dialog, select the 'Actions' tab and press the 'Add' button. 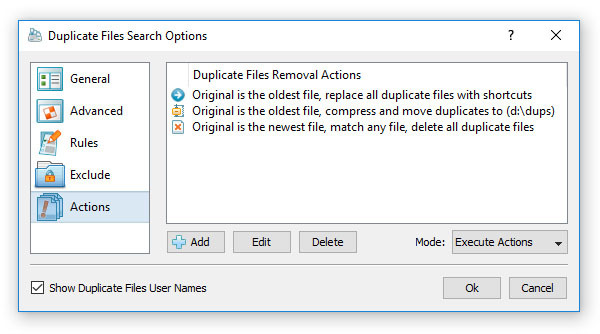 On the duplicate files removal action dialog, set an appropriate original file selection mode, select a duplicate files removal action type and press the 'Ok' button. 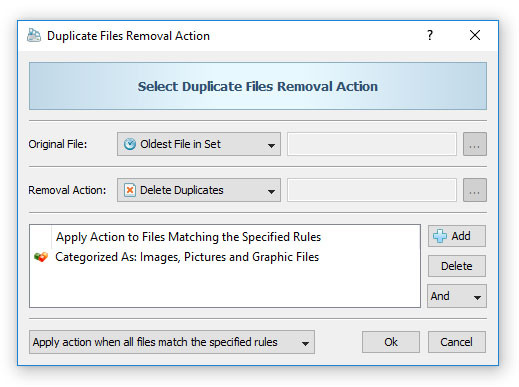 In order to edit a previously created duplicate files removal action, double click on the action item in the duplicate files removal actions view. Initially, automatic duplicate files removal actions are created in the 'Select' mode allowing one to review selected actions and make sure everything works as required. Once the configuration is carefully tested, the duplicate files search command may be scheduled to be started periodically and all configured duplicate files removal actions executed automatically. In order to automatically execute configured duplicate files removal actions, open the duplicate files command dialog, select the 'Actions' tab and set the actions mode to 'Execute'.